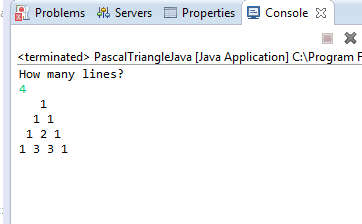 Here you will learn about pascal triangle in java with a program example. It is a triangular array of the binomial coefficients. It is a number pattern which starts with 1 at top and then placing numbers below it in triangular pattern. Each number is obtained by adding two numbers above it. Take below example, here 4 is obtained by adding 1 and 3 above it. Below I have shared the java program to print pascal triangle. Each term in the pattern is obtained by using combination formula given below. Comment below if you have any doubts related to above program.